Are You Rapture Ready? was originally under the authorship of Todd Strandberg and Terry James. Due to a misunderstanding with the printer it is now re-released under only Terry’s name. But both Todd and Terry wrote the book. It is as up to date as when written originally, as you will see upon reading it! A tremendously important book for our time! It could take place at any moment! Millions of people will vanish faster than the time it takes the lids of the astonished eyes of those left behind to begin their downward blink. Jesus Christ’s Call to God’s Family is Imminent! Are You Rapture Ready? authored by both Todd Strandberg and Terry James is the powerful, just re-released book that presents, often with wry twists of humor, a probing look into the awesome prophetic event called the Rapture. Regular visitors to raptureready.com will instantly recognize the many dynamic topics of their favorite prophecy website. New visitors to the website will find it a book of amazing revelations about the coming great disappearance. All will be infused with deep, made-easy-to-grasp truths of end-time Bible prophecy. Are You Rapture Ready? is a book you will want to give friends and family, especially those who look at today’s swiftly moving world events and wonder what on earth is going to happen next. Are You Rapture Ready? is the one book those left behind to face a tumultuous world will need to guide them while prophesied events of the Tribulation era unfold all around them. The salvation message of the Gospel of Jesus Christ leaps from the pages in compelling, intriguing, yet not condemning or preachy ways. It puts forward in every chapter that God’s love is even more powerful than His judgment. Strandberg and James use the unique, creative technique of leading off each chapter with a scene from the various Left Behind series of novels written by Tim LaHaye and Jerry B. Jenkins. Todd and Terry then delve into the theme of each of those scenes, dealing with them in a nonfiction way, using past and current issues and events, combined with prophetic Scriptures to project an entertaining, yet profoundly in-depth view of where this generation stands on God’s prophetic timeline. 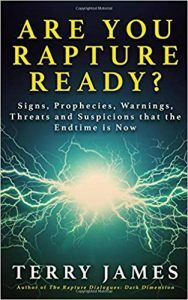 Are You Rapture Ready is the book you will want to get for your church library, your city library, and your own library. It is a spiritual as well as an entertainingly informative book through which you can show God’s love to people in your sphere of influence, and to a world that needs to know Christ as Savior and Lord. Please prayerfully consider buying a number of copies. Help Todd and Terry get out the life-changing message that Jesus is the only way to God the Father, and that He wants all men, women, boys and girls to be Rapture Ready! Are You Rapture Ready? can be ordered by going to the following.